New production style harmonic damper. Eliminates the need to clean or machine old unit and is economical way of replacing a damper with perished rubber. Fits Small Block Chevrolet 400 style with external balance 8" diameter. 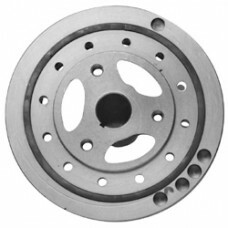 Also used on 377 & 383 cubic inch stroker kits using cast crank or 400 spec parts.